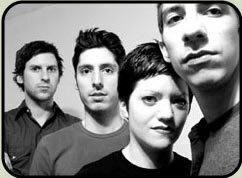 HIP Video’s Andy Gesner is proud to ring in the New Year with Equal Vision Records (the label that brought us Saves the Day) and their female fronted, break out band of 2003, The Rocking Horse Winner. This Florida quartet’s lead singer Jolie Lindholm is known for her vocal work with fellow Floridian Dashboard Confessional (aka Chris Carrabba), but is jaw dropping in her band’s debut video “Miss You,” arriving on your desk this week! Every programmer planning to add this clever, endearing clip for the CVC add dates of February 7th and 10th is encouraged to urge their viewers to e-mail the show to chime in on what they think of the video (good or bad). On St. Patricks Day we will draw one winner from all e-mails nationwide. As an added bonus for viewers, if they can pick out Dashboard Confessional (aka Chris Carrabba) during the video (he makes a cameo appearance), the viewer gets a bonus entry! The winner takes home a brand new Sony Portable MP3 Player loaded with the complete Equal Vision catalog, along with RHW t-shirts and goodies. And to make it fun for the programmers, if the winning e-mail picked on March 17th is from your show, you win a new Sony Portable MP3 Player ALSO! (The more e-mails you submit toinfo@HIPVideoPromo.com , the more chances you have to win). Here’s an overview of the “Miss You” clip. From the time Jolie Lindholm wistfully flicks on her tiny bedroom television, the video takes the viewer wandering along with Lindholm’s whimsical mind as she muses fondly about the one she’s missing. We’re treated to a series of naggingly familiar visual quotes from popular movies – decidedly not classical cinema – you won’t find any baby carriages plummeting down marble stairways here. Instead there’s playfullness..pure fun..from the beer poured on a buddy in the pub to the low-budget TV green screen meteorological contretemps with a few others in between. The undeniable expression of the bond, the yearning, that exists between these two young people and them alone, is highlighted by the surreal irony of the grandmotherly piano teacher’s frustration at her pupil’s daydreamy inability to concentrate on, of all things, “Black Star” by Yngwie Malmsteen.The bright, spirited musical performance on “Miss You”, however, banish forever any temptation to lapse into melancholy; thanks in no small part to Henry Olmino’s tastefully clever guitar playing and Lindholm’s endearing delivery. This isn’t nostalgia, it’s anticipation.